St Ives is a market town in Cambridgeshire, England, around 19 kilometres (12 mi) north-west of the city of Cambridge and 90 kilometres (56 mi) north of London. It lies within the historic county boundaries of Huntingdonshire. 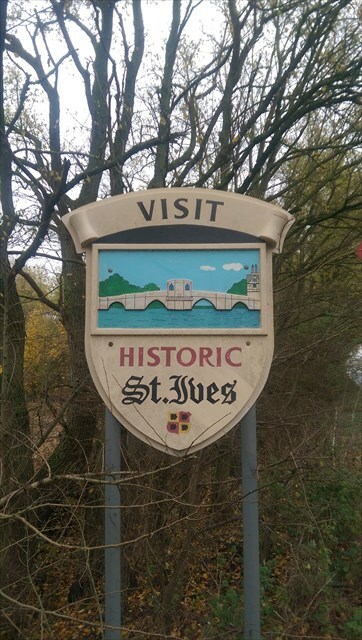 Previously called Slepe, its name was changed to St Ives after the body, claimed to be that of a Persian bishop, of Saint Ivo (not to be confused with Ivo of Kermartin), was found buried in the town in about 1001/2. For the past 1,000 years it has been home to some of the biggest markets in the country, and in the thirteenth century it was an important entrepôt, and remains an important market in East Anglia. The cache is just south west of the village sign on the B1040, parking at GZ travelling towards St Ives. Please do not go climbing all over the sign!